This is the 7th post in the series, 14 Tips to Present Awesome Charts. A legend, as you know, is a guide which helps the audience read your chart. 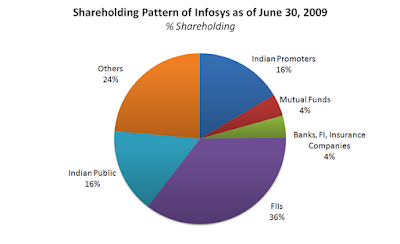 If you are comparing the share prices of Microsoft and Yahoo and your chart has two line graphs, then your legend tells the audience which line denotes which company. The legend is a 'visual' symbol of the data series that has been plotted on the chart. A data series is a series of data (many data points) related to the same variable (like share price). A legend helps you read the chart with ease. When you don't need a legend? By definition, a legend tells you which bar or line chart is for which data series. Hence, you need a legend only if you have more than one data series on your chart. You don't need it if you have only one data series. 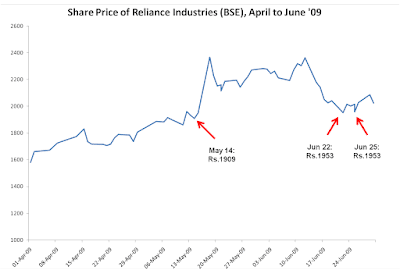 Example 1: The chart below depicts the 3 months share price of Reliance Industries. There are some 75 data points but one data series. Because, all data points are nothing but different values of the same thing, the share price. In this case, you don't need a legend. Most of the graphs you would have seen in your life will have a legend even when there is only one data series. Why? Reason 1: Because the legend comes by default in the software. Reason 2: Because of your ignorance. You overlook this aspect. How does it matter if you have a legend in Example 1? You end up wasting precious space. By deleting the legend you get more space in the chart. Your chart also looks aesthetically much better. All this adds up to making your audience more comfortable. There are cases when you have more than one thing to denote and you can have a legend but the legend still does not help at all. You don't need a legend when having it only adds to the complexity. Just click on this link and see both the charts. Life for the audience will be hell if you present like this. Both the charts have been taken from real life and are not hypothetical examples cooked up by me. Example 2: This chart is not as bad as the one in my earlier post. This has been taken from American Heart Association's website (During the course of this series, I have become a fan of American Heart Association, Reliance and HUL. 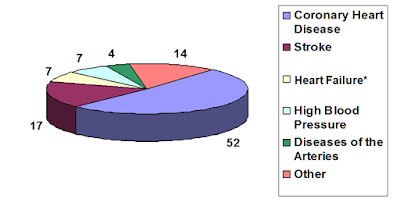 Every alternate post refers to atleast one chart from each organization's website). Where do you place the legend? The legend by default is always placed to the right. But there are in total 5 places where you can place it. 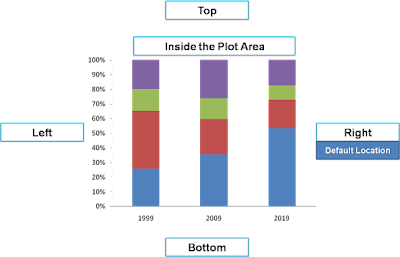 Top, Right, Left, Bottom and Inside the Plot Area (along with the data points). Where you place it has a huge impact on the usefulness of the legend. Remember the objective of a legend is to make the chart easy to read. 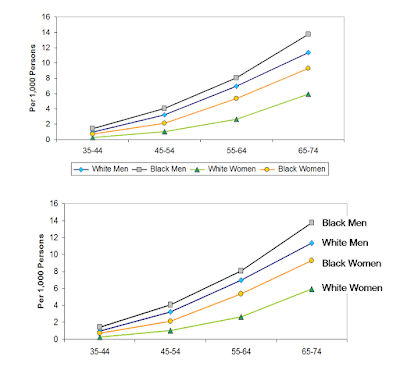 Example 3: Another two charts from the American Heart Association (AHA). Try reading both the charts. Why is it easier to understand the bottom one? Think. Look at the placement of the legends. 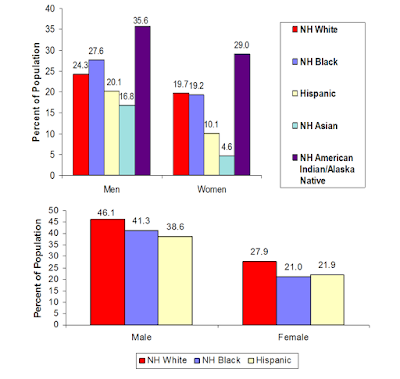 In the top one, the bars are arranged left to right (NH White, NH Black, Hispanic...) but the legend reads top to bottom. The bottom chart has a legend which reads left to right and it has bar charts which are also arranged left to right. The legend is in perfect sync with the bar graphs. Example 4: The presentation from the AHA has so many charts that this entire post can be covered by analyzing them. See this one from the stable of AHA again. See the chart at the top for 5 seconds. Try not looking at the second chart. Tell me what what does green signify? White women or black women? This is another difficult chart to read. When you present slides after slides and this charts comes up, how many seconds will you give the audience to see this? Given that time is always scarce, a better way is to place the legend inside the plot area. I have modified the chart and created the one at the bottom. Makes the job of the audience a lot easier. When you make a chart, spend one minute thinking about the legend. If you do that, you will do a huge service to your audience. Only when the audience understands your chart, will you be able to meet your presentation objective. Disclaimer: Charts have been used for educational purposes only. They will be removed if the respective organizations raise any objection. @Anitha Please elaborate. I am not sure I get your point.